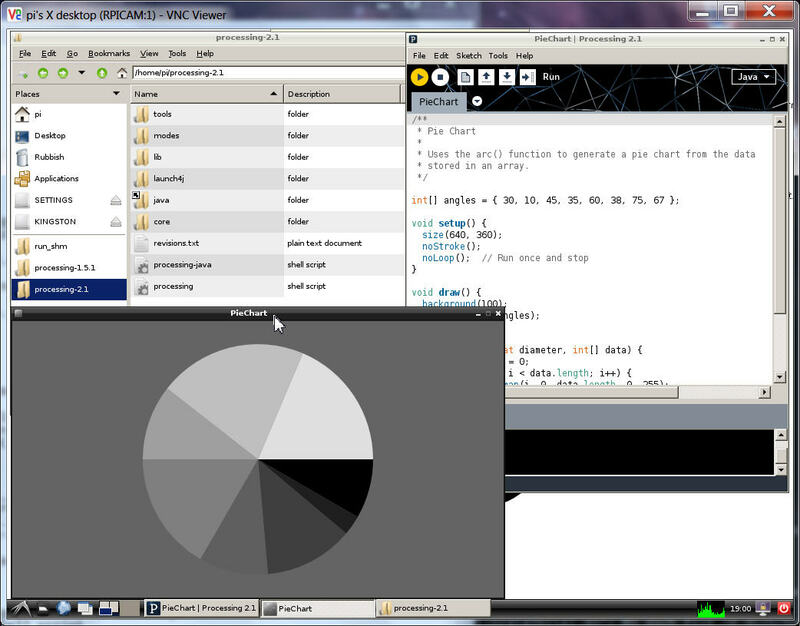 while the start IDE and start sketch/run is very slow, a running processing sketch still has game-speed, even via VNC! its time to get the arduino running! so it is more a java + IDE serial software problem. 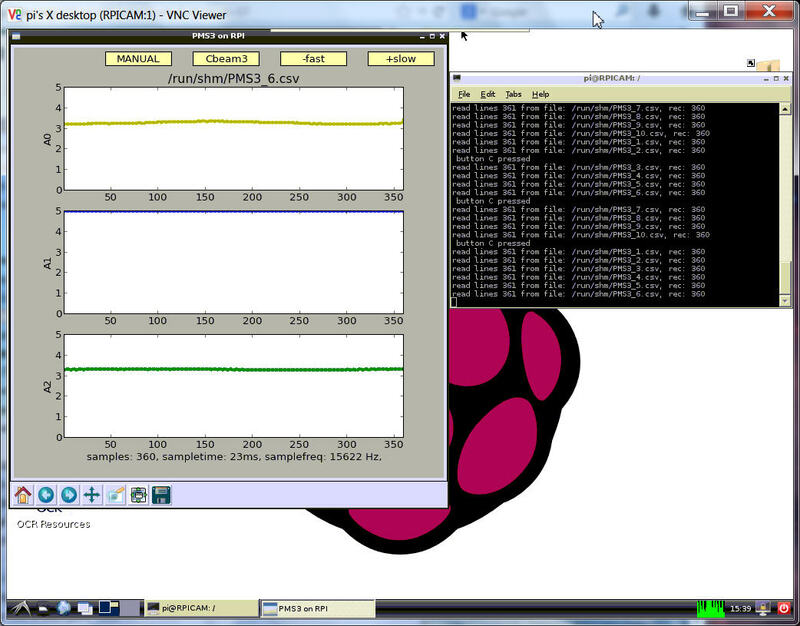 RPI cpu is on 100% load. allow 10 files in temp fs, as a ringbuffer. 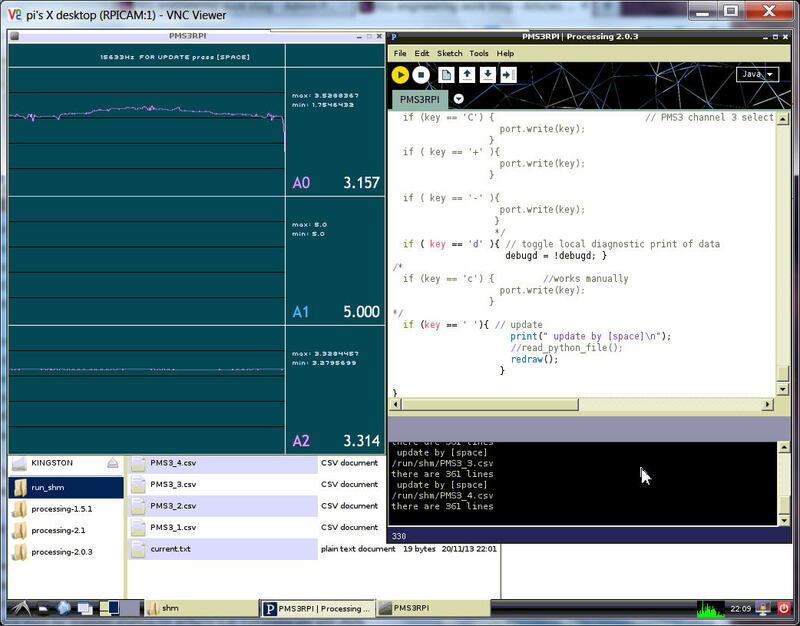 as no processing is running the python sketch ( on the slowed down arduino / 1 batch every 146sec only) now runs on 10 .. 15% cpu. But i will start tuning the arduino only AFTER i get the processing running, as a file reading version instead of serial communication. BUT that means also NO ARDUINO OPERATION possible from there. 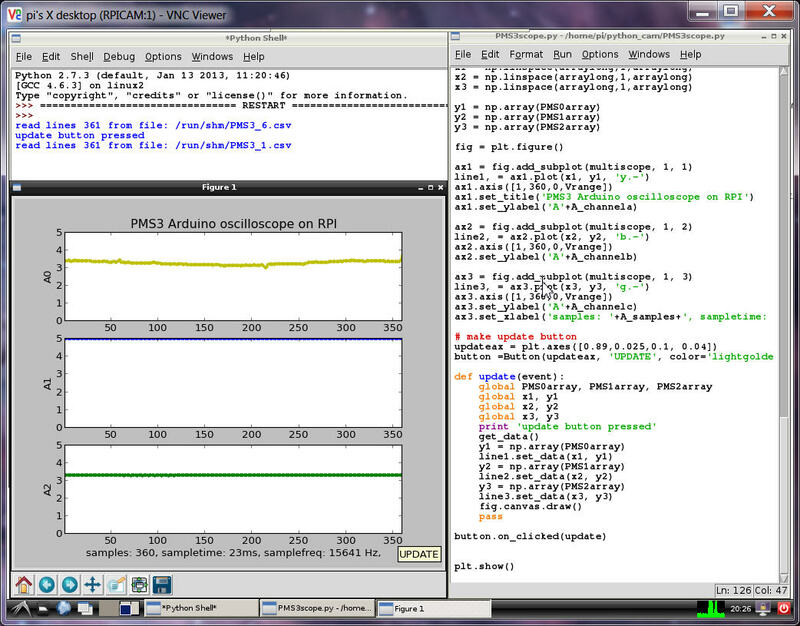 and the now inactive scope window of processing and python in background takes about 20%load. but need 6 sec more to redraw the scope screen. 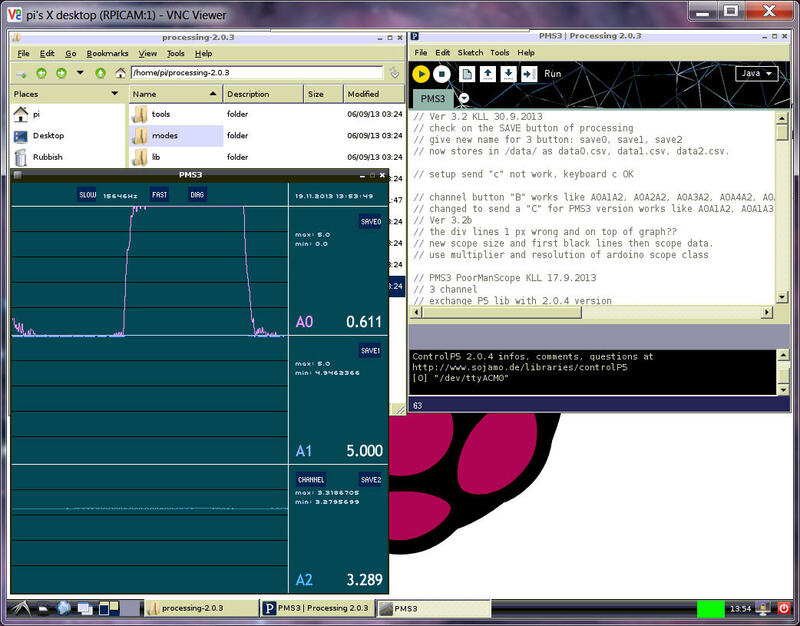 but starting now the arduino IDE additionally to make some tuning there, RPI cpu stays at 100% and arduino load after 5min?. Thats definitely too much for RPI. 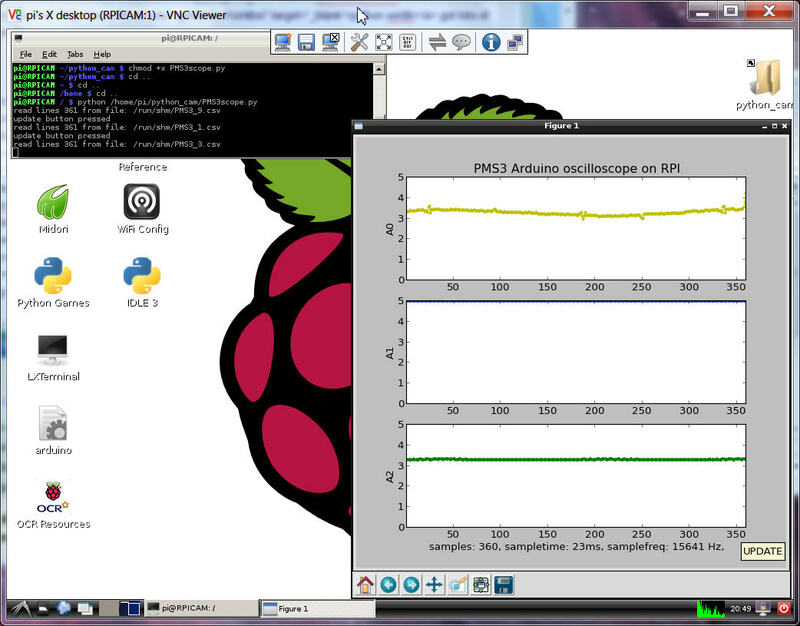 the python service must be stopped anyhow for arduino IDE to can communicate with AVR. still have to work on the init! as the scope file load / screen update needs about same time i don't need to push it more. and zip them away to usb stick. "digital storage oscilloscope" is the word! 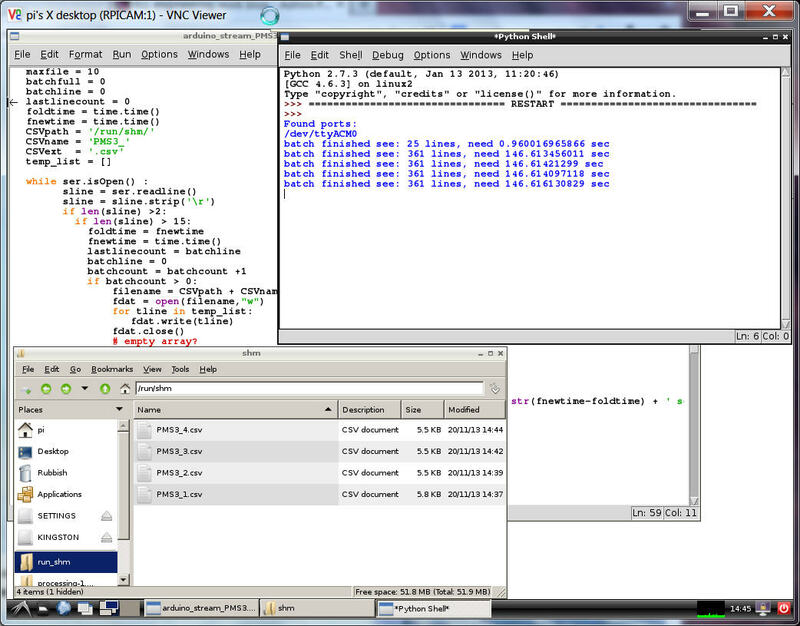 -++- i miss the operation of the arduino, but there can now be only one way, it must be at the start of the python script. 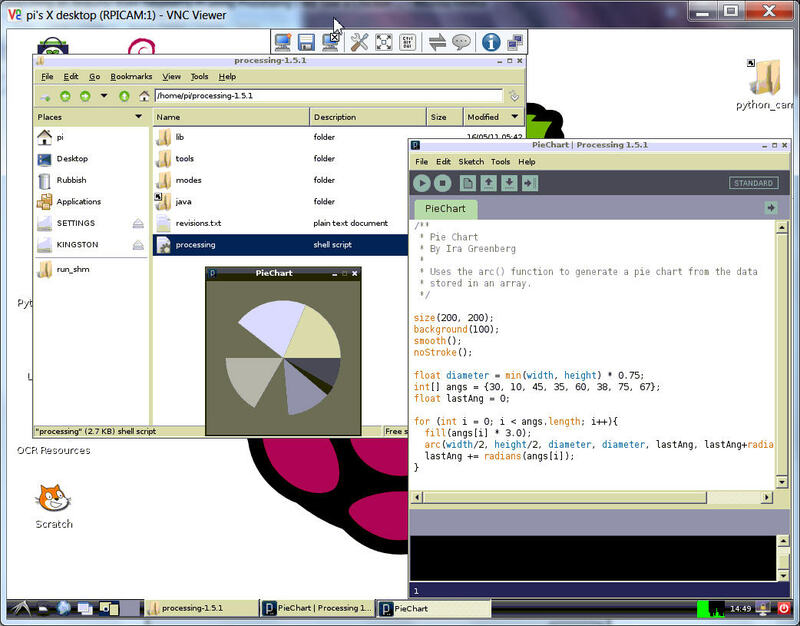 and load it at start to python and via serial to arduino. -+++- if JDK8 would help about the speed problems? i install PYTHON 2.7.6 windowsinstaller on it and with the help of python winlib got lots of extension libs. 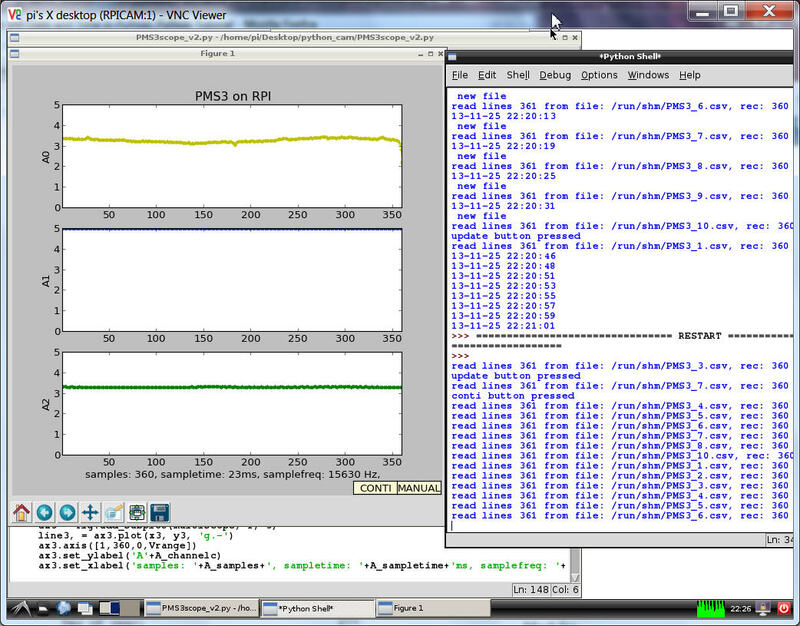 at first time it was very slow, but from second start the graph needed about 8 sec to load. i found that it needs only 3 sec to UPDATE!! 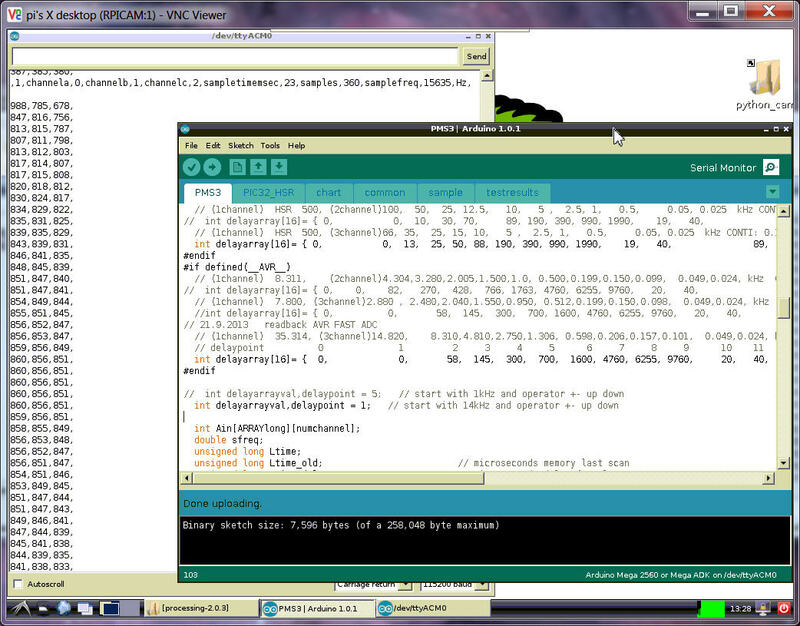 so the timing in arduino could be changed to much faster. also i see that when i touch the arduino A0 the USB communication to RPI is disturbed, and the scope gets batch not fit to the 360 value.. there is no check on that in both python scripts. 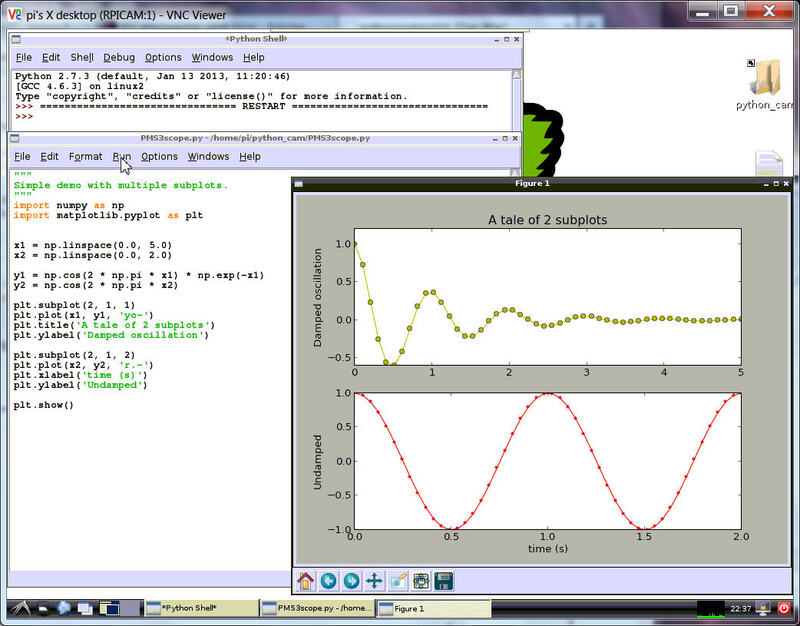 the scope runs into errors from matplotlib but not stop/ can recover when good data arrive. anyhow that was just a test. and then a get_data is done. so there is reason why we startup in manual ( update) mode. hmm, i got confused with the batch timing! 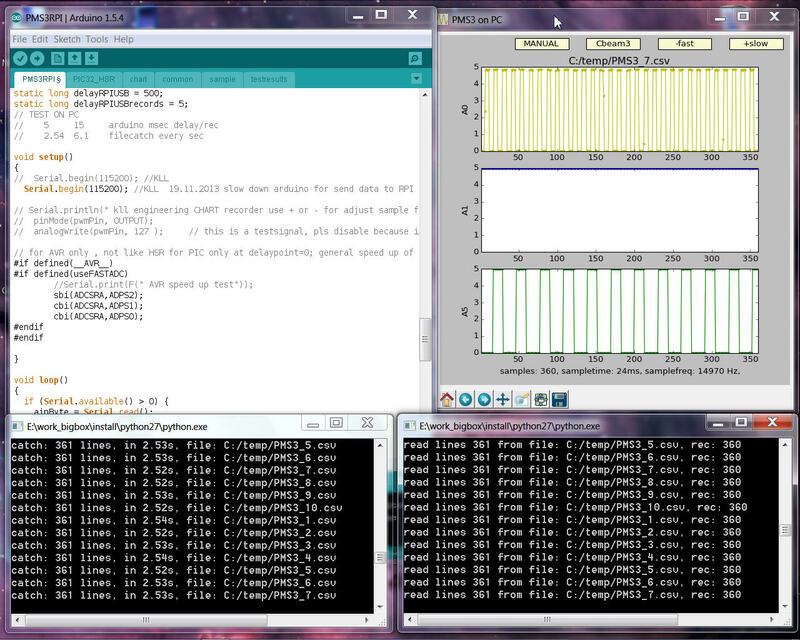 in arduino i programmed a WAIT after the batch data are send. ( 360 rec counter not used for program control ) it waits for the headerline to understand that new batch comes. 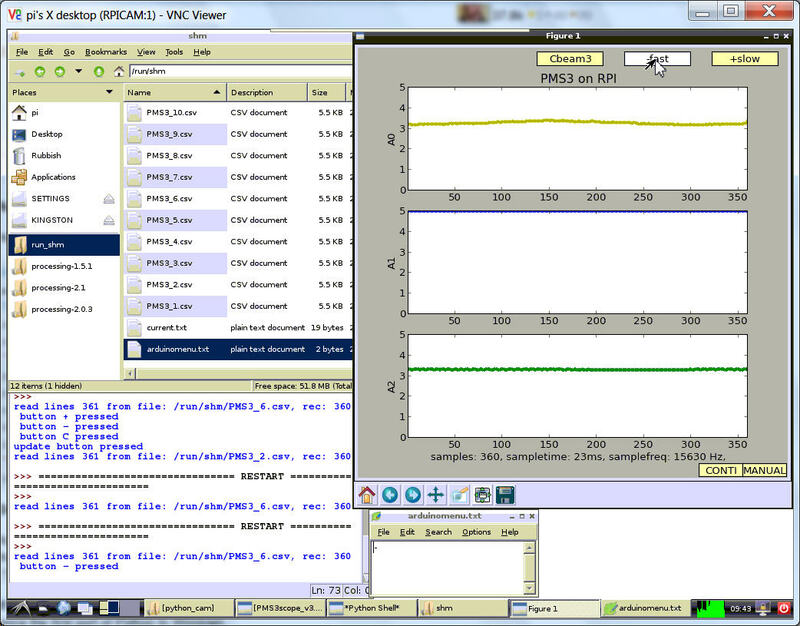 and use the copy paste ( to PUTTY window ) to test / improve it. the code ( file content) can be in separate text files shown from BLOG and finally in a ZIP file to download. i did not format the width like i did in the BLOGs before. ( over the limits of the CMS template layout ), when the browser window is reduced, the images are automatically fitted in the BLOG column. they just want it running and play with it. but handling of the min. 4GB files is too time consuming. My idea is to make berry-boot backups and put them up for download. so you can play and not fuckup your private system. that is how you can backup / recover a whole OS, even to a new berry-boot SD. with that you can reset / init a installed OS to its defaults, means delete all your user settings !! but to do this i must start from scratch.